Touring around the Xizang (Tibetan) Autonomous Region, you can have an unforgettable view of the grandiose and aweinspiring architeture of monasteries and palaces, which illustrates incontrovertibly the artistic creative genius of the industrious Tibetan people. Eversince Buddhism was introduced to Xizang in the seventh century, for over a thousand year its influence upon the people and their culture has been profound and all-embracing, though it has Tibetanized as Lamaism. Along with the religious practice the Buddhist art has been on the upgrade. The most noteworthy achievement is the architecture of monasteries and palaces built on levelland or in mountainous area on a grand scale. In Lhasa, you can see the most majestic building in the whole of Asia, the Potala Palace. And also the Jokhang temple, the Drepung Monastery, the Sera Monastery and the Norbu gling-ka Garden, each has a special history. Besides, many other ancient temples and scenic sites are well worth visiting. To the South of Lhasa, the earlist monastery stands with all magnificence at Samye. That is the Samye Monastery, a wonderful combination of the Chinese, Indian and Tibetan architectural styles, constructed around 779 A.D. Quite unprecedented in plan and on scale, its great hall has three stories surrounded by its outer premises, a wall on the four sides and four pagodas at each direction symbolizing the Buddhist cosmography–the sun, the moon, the mountain Sumeru and the Four continents. Large numbers of craftsmen from Han and Khotan went in for the design and construction of the Samye Monastery. It took twelve years to complete and the celebrations on the inauguration ceremony lasted a whole year. 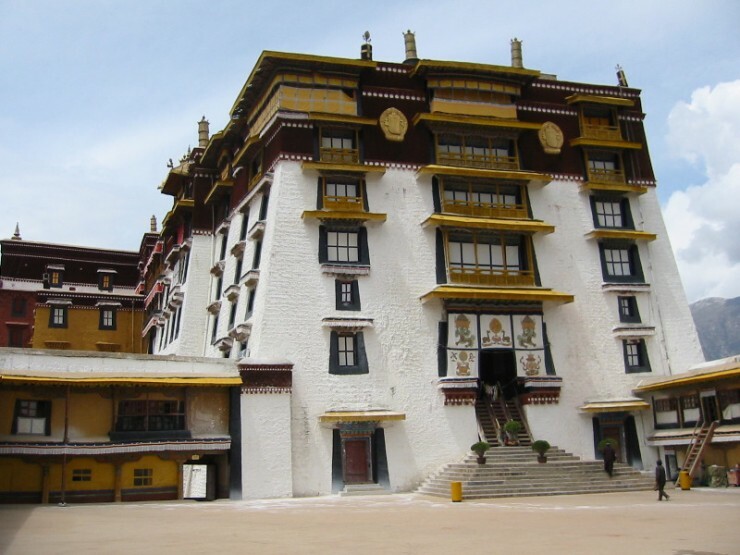 The Trashilhungpo Monastery, built in 1447, is situated in Shigatse–the second largest city of Tibet. It is the seat of the Panchen Lama Rin-po-che. Its Big Maitreya Hall, over fifty metres high, enshrines the Big Maitreye Buddha quite the same as the ones in the Chengde Monastery and Yonghe Palace in Beijing. Standing on the south side of the Trom River, the Sakya Monastery, a typical building of castles based on the style of Yuan Dynasty, is the most representitive example in the history of the Tibetan architecture, which gives a reflection of the tranquil political scene in Yuan Dynasty and the cultural exchange between Tibet and inland. The monastery, occupying an area of 45000 sq.m. with halls, chapels for worshipping the buddha, political bodies and printing house and so on, presents a splendid sight. Between 1414 and 1424, the dPal-Khor mChod-rten Monastery was built at Gyantse. It has seen stories, 108 doors and a total height of 107 feet, combining the style of temples and pagodas. The Sha-lu Monastery is an unique mixture of Han and Zang architecture with Tibetan halls on the ground floor and Han halls on the ground floor and Han halls on the top-floor roofed with glazed tiles. Nyethang sGrol-ma Lhakhang Temple was built by A-ti-zha, the Buddhist pandit of Bengal. Having made full use of the terrain, it was delicately built with its back to mountains and face to waters, darkly hidden among trees and flowers. Moreover, every monastery is a tresure-house of Tibetan Buddhist art. There are frescoes and statues both abundant and vivid preserved in the monasteries. The Buddhist images of Sakyamuni, Avalokites’ var., Mangers-Kumarhuta, Ksitigabha, Samantabhadra are strongly marked with the Tibetan characteristics. For instance, the image of Avalokites’ vara is with a man’s body, sixteen Arhats formed as one group and dPal-ldan 1 Ha-mo (the Propitious heavenly Maiden) has a fiendish face, especially’ Jigs-byeds, the tantrik statues erected by the lamaists are fierce of visages with decoration of skeleton and drinking bowl made of skull in one hand. In Tangyur which together with Kangyur comprises the Tripitaka n the Tibetan language there records the bases and rules of Buddhist painting and moulding. Unlimited by these laws, the Tibetan artists created lots of moving images tinted with local flavour and human temperament. In the Potala Palace, Statues of King Songtsan Gampo and Princess Wen Chen the most illustrious figures in Tibetan history, were moulded at about the end of the seventh century. the Hans and other Chinese nationalities, so they are the valuable materials for the study of Tibetan history and art. Another form of Tibetan painting is called “thangka” (scroll painting). Having a great influence upon the Tibetan drama, thangka draws its materials widely from every aspect. They vary in size and the two biggest thangkas are collected in the Potala Palace. By the way of demonstration we can have some idea of the long history and splendid culture of Tibet, though many of the other historical sites, ancient graves, and unearthed artifacts are left unsaid in this brief introduction.